Paciolo was born in Tuscany in 1445 and received an education in Italian rather than Latin. This was concentrated on knowledge that would be of use to merchants. In his late teens, he moved to Venice to become a private tutor to a merchant’s sons. Meanwhile, he continued his own studies. This prompted him to write the first of his many books, an arithmetic primer aimed at the boys he had been employed to teach. At some point in the early 1470s, he entered into the Franciscan order. In 1475, Paciolo went to Perugia to teach, soon taking the chair in mathematics, the first to hold that position. To help his students, he wrote a substantial textbook, among the first to be written in the vernacular. He continued to act as a private tutor until told to cease that work in 1491 to concentrate on his academic career. In Venice in 1494, he published his first printed book, Summa de arithmetica, which dealt particularly with arithmetical and geometrical subjects. This book was intended as a school textbook, and was a comprehensive collection of mathematical knowledge as it stood at the time. It is notable for being the first printed work to contain an Italian-language description of algebra and for describing a system of double-entry book-keeping. Paciolo also detailed the correct methods for using ledgers and added a caution that nobody should end his working day unless he had made his debit and credit columns agree. The book also covers other topics such as the ethics of accounting, as well as the Rule of 72, a method of determining economic returns. Paciolo also wrote a treatise on magic and mathematics, notable for being the first known guide to performing card tricks. As well as instructions on juggling and fire-eating, the book also included a collection of mathematical puzzles. For unknown reasons, it was never published in Paciolo’s lifetime, languishing in Bologna University’s archives and appearing in English only in 2007. He also translated the Elements of Euclid and wrote a book about the application of proportion in architecture. This book is notable for its early use of skeletonic solids and for discussing the use of perspective in painting. In 1497, Duke Ludovico Sforza invited Paciolo to come to Milan, and he accepted the invitation. Once there, he met Leonardo da Vinci and lived with him for a time. 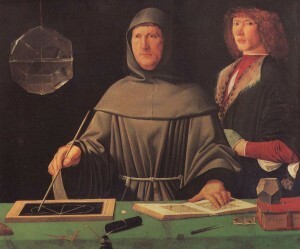 During this period, the two men worked together and Leonardo learned mathematics from Paciolo. However, the two were driven from Milan in 1499 when the city was taken by the French, who forced the duke into exile. They remained close, but seemed to have grown apart around 1506. Paciolo lived on in Sansepolcro for more than a decade, dying in his early seventies, probably in 1517.